A couple of weeks ago, my husband and I took the kids to Downtown LA, and while we were there, we went to eat lunch at Langer's Deli, which is a bit of a local landmark. It's an old-fashioned deli/restaurant that is about to celebrate its 65th anniversary. The adults at the table followed the advice "When in Rome, act like a Roman", and we each ordered the restaurant's specialty: Pastrami, cole slaw, and Swiss cheese on Rye. And now I need to pause and wonder. Does one capitalize Swiss and Cheese? Or just Swiss? Or is it so very far removed from Switzerland that it doesn't need to be capitalized at all? I don't want the entire nation of Switzerland, kind as they are, to go the way of Kleenex Brand Tissues (Reserved). Anyway. My kids, in their infinite ability to astonish me, each ordered a meatloaf sandwich. What?! Don't they know that meatloaf is gross? I couldn't believe that any child of mine would voluntarily put meatloaf in his or her mouth. They gobbled up the sandwiches and assured me that they love meatloaf. Ummm. Okay. I am not really sure how they knew what meatloaf is, or where they had heard of it, or much less tasted it, but there you have it. They knew it, ordered it, and loved it. They have been asking me to make meatloaf for dinner. And today, I humored them (despite my better judgement). However, since I am going to have to reward myself for eating meatloaf, I also made a yummy dessert. This recipe was presented as a "buckle." I have always understood a buckle to be more like a Brown Betty, Cobbler, or Crisp. This came out much more like a coffee cake. The bottom layer is very light and fluffy, with a layer of strawberries and a crunchy topping. So I am going to consider it to be a coffee cake. The good news, that it is so very delicious, means it won't stick around for long. It will be eaten long before anyone can have an issue with its name. Preheat oven to 350 degrees, with rack in center position. Coat two 9-inch square cake pans with cooking spray, and line with parchment, leaving an overhang on 2 sides. Slice strawberries and set aside. Whisk together 2 cups of the flour, baking powder, and salt. Beat together 1 1/2 sticks of butter, sugar, and the lemon zest until light and fluffy. Beat in eggs, 1 at a time, then beat in vanilla. Beat in flour mixture in 2 additions, alternating with sour cream, beginning and ending with flour mixture. 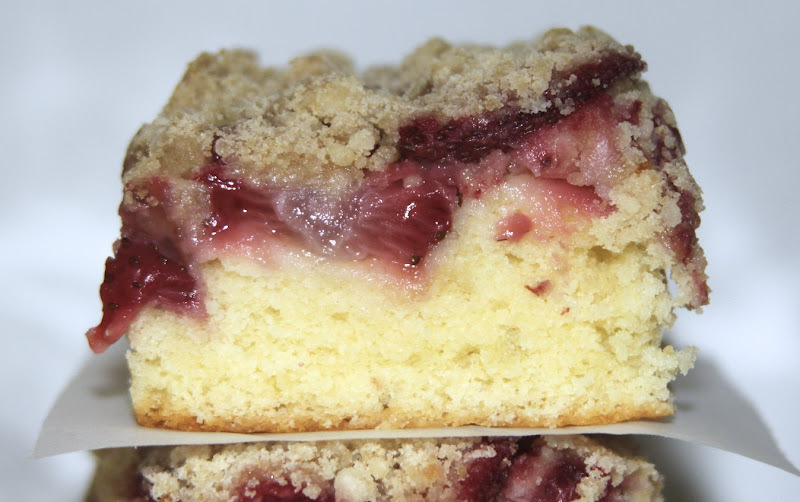 Make the crumb topping: Stir together remaining flour, brown sugar, and salt. Melt the remaining butter, and stir into the flour mixture to combine. Divide batter between pans. 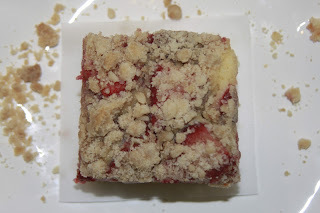 Top with sliced strawberries, and sprinkle with crumb topping. Bake until golden on top and cooked through, about 1 hour 5 minutes. 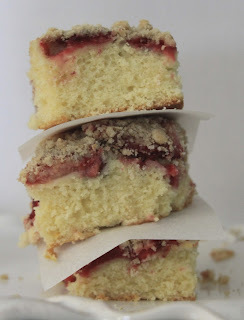 Let cool completely in pans on wire racks, then lift cakes from pans using parchment. Remove parchment. Before serving, cut into 2-inch squares. This post is linked to the Improv Challenge hosted by Kristen at Frugal Antics of a Harried Homemaker. Check out what everyone else did with strawberries and cream! have been searching for the finest website for getting one. Would you advise me kindly, where can i get some? Thanks a lot for sharing this with all amongst us you actually decide what you are having a debate about! Bookmarked. Kindly even see my internet site =). We're able to have a very good link exchange contract between us! far delivered agreeable from you! However, how can we communicate? thing I often do! I enjoy reading a put up that will make folks think. eventually come back later in life. I want to encourage yourself to continue your great job, have a nice weekend! can have a hyperlink alternate contract among us! I appreciate, cause I found just what I was looking for. You have ended my four day long hunt! about my trouble. You're incredible! Thank you! it for your efforts. You should keep it up forever! Good Luck. by him as no one else know such detailed about my trouble. subject to be honestly one thing that I feel I'd hardly understand. The whole thing just goes over my head because of how intricate and broad it all is.. I am looking forward to your subsequent publishings, I will try to get the gist of it.